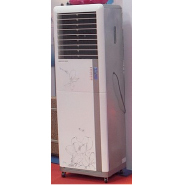 Portable Air Coolers for household or commercial use; cover 35 sq m; 180 Watts of power; Suitable for use with solar and electrics;Ideal for high temperature & low humidity environments; Environmentally friendly & low cost. The portable JH157 air-coolers are suitable to cool areas of 25 to 35 square metres, they use 180 Watts of power and are therefore ideal for use with Solar or electrics. They work by using water, stored in an internal water tank, to supply a filter that the hot air is drawn through and subsequently cooled before being returned to the room. 1. They use evaporation of water as the coolant and therefore eliminate CFC’s and refrigerants. 2. They use very low power, like 10% of traditional air-conditioners. 3. They can be used with Solar, because of the low power use. 2. Air coolers do not require a hose vent so it is not necessary to place them near an external window. 3. Repairs and Maintenance is simple because of the small blower fan and water pump and don’t need compressors or re-gassing & etc. 4. Much healthier than air-conditioners because windows & doors can be left over. Because they can be used in open environment they ventilate the room and the cooling pads & water are very good air filters to filter out dust, pollen, pollution and etc.